Modular home customization can give you all the features you want in your new home. There’s almost nothing you can’t build with modular construction! There are very few manufacturers that work on a strictly “as is” basis. Since there’s no chance for customization, they can order absolutely everything in bulk, their builders can work quickly, and there’s very little chance of anyone making a costly mistake. This means huge savings for the buyer, but they won’t be able to make even the smallest changes. The vast majority of manufacturers will allow for at least some customization, most allow nearly infinite customization, and some don’t even have “standard” models; every home they make starts from scratch. Regardless of the amount of customization you plan on doing, you will need to work closely with both your GC and your manufacturer. 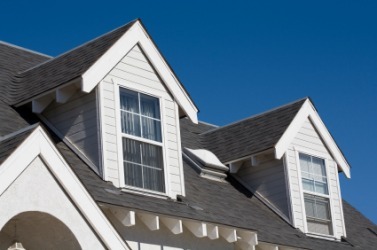 Adding dormers to your roof is a great, inexpensive way to add character to your exterior and increase the amount of natural light in your home. Exterior modifications are often the easiest to make since they usually only mean changing a window style or what kind of siding you want on the house. The following is by no means a complete list of customizations that are available. It is simply meant to give you an idea of how the process might work. Lets say that you’re looking at a two-story design and you like the floor plan, but the exterior looks a little bland. There’s a short shingled roof, four front-facing windows on the second floor, two on the bottom floor, and a door with a single step stoop raising it off of the ground. Exterior changes can go a long way toward making your house feel like a home. Changing the roof is often the easiest design shift to make and is surprisingly inexpensive. Increasing the angle and height of your roof, extending awnings, adding decorative gables or dormers, and changing basic shingles to architectural shingles are all great ways to add more personality to the roof. 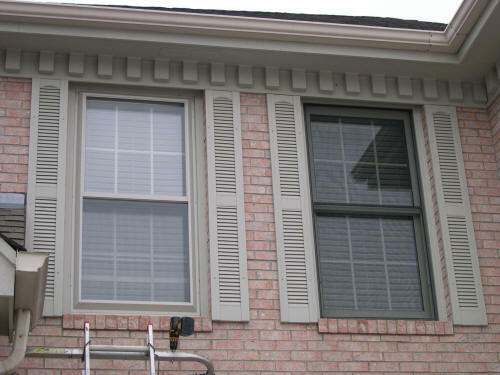 Even just adding decorative shutters to your windows can give your house a lot more personality for a little more cost. Next you might decide that the problem is really the windows. What you really want isn’t four windows across the top, but rather two larger windows. Depending on the level of customization that your manufacturer is offering, moving or adding windows can come with either a small fee or a hefty hike in manufacturing costs. Sometimes adding too many windows can threaten the structural integrity of a home and so you won’t be able to add more at any cost. So you’ve been informed that changing the four smaller windows to two large windows is within your budget. You now have to decide the material, the trim, the style of window, what kind of glass you want, and a whole bunch of other options. Even now that you have the perfect windows, you still feel like something’s missing. A very popular addition is adding a front porch with either a gable or a full roof over it. This gives the house a more welcoming and three-dimensional feel, but be careful that you’re not building too close to the street for town regulations. For more ideas on exterior customization, check out our 7 Tips For A Beautiful Modular Home Exterior. 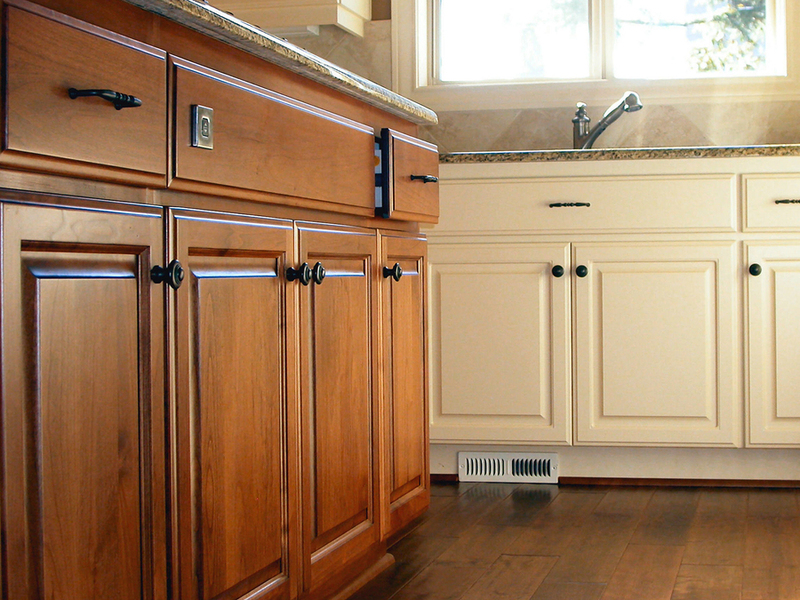 Changing kitchen cabinets is a common customization. Watch out though, cosmetic customization can quickly add to your costs without increasing the resale value of your home. Small interior alterations like changing what types of cabinets to use and what your flooring will be like in different rooms are extremely common. Any alterations that won’t change the position of walls or exterior features (like windows) can be done at will and without fear of racking up too many extra costs. If you want to start changing rooms around or removing walls, you may start running in to problems. Again though, this depends on the manufacturer you’ve decided to work with. Most manufacturers will be happy to make major changes even to their standard plans. A major factor to consider when planning the interior of your home is what appliances you’ll be using. While most appliances can be upgraded at a later date, having them installed and delivered with the rest of your home will mean that you’re getting the manufacturer’s discount on expensive appliances that they buy in bulk. 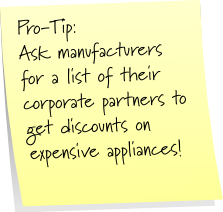 Also, ask your manufacturer about Energy Star appliances. Even if they’re more expensive up front, you can save money in the long run by reducing your electricity costs. This next section is often overlooked until very late in the process and can mean a whole lot of time getting wasted. While your HVAC (Heating, Ventilation, and Air Conditioning) system and your utility hookups may not seem like as big of a deal as the design of your rooms, having a floor plan that hasn’t paid enough attention to these aspects can cost you big time in the long run. Always make sure that there are more than enough electrical outlets placed in convenient locations throughout your home. They’re inexpensive to install, and no one has ever complained about having too many. If you’re planning on installing a home theater system, a security system, or any other custom electrical system, you should let your GC and manufacturer know so that they can figure out how much additional wiring will be needed. If you’re planning on drilling a well or doing any other onsite utility management, you will need to inform the manufacturer so that they can include the proper intake pipes in the design. Similarly, below-ground electricity requires more initial planning than overhead wires. Almost all new homes being built now require below-ground electricity, so be sure to include this in your checklist. 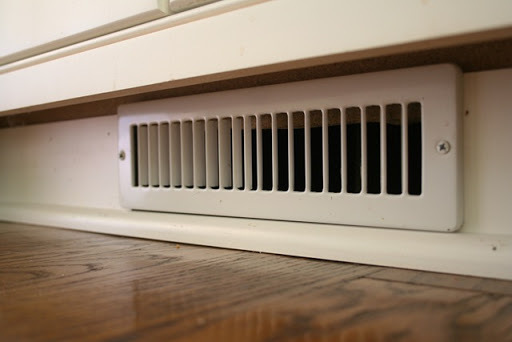 Having at least one vent in every room, even if it’s a small one like this, will keep air flow moving throughout your home. Modular homes are so precisely constructed that they need more ventilation than other homes to prevent them from getting stuffy. A well-constructed modular home will be much less expensive to heat and cool than a site-built home because the precision with which the home is assembled ensures that homes are much less drafty. The unintentional flip side of this is that if you don’t have proper ventilation, your home will start to smell musty. You should have a vent installed in every room of the house, especially in bathrooms where condensation can build up and cause water damage. You should have your heating and cooling done by zones and put on an automatic timer. There’s no need to be heating bedrooms during the day if no one uses them until night time.